I am about to share the worst trade of my carrier with you. It cost me a fair amount of sleep (and probably cost me a number of subscribers, who must have thought Simon is quite the moron). Here is the sad tale of a good trade hijacked by an ETF flaw (fortunately there’s a happy ending). 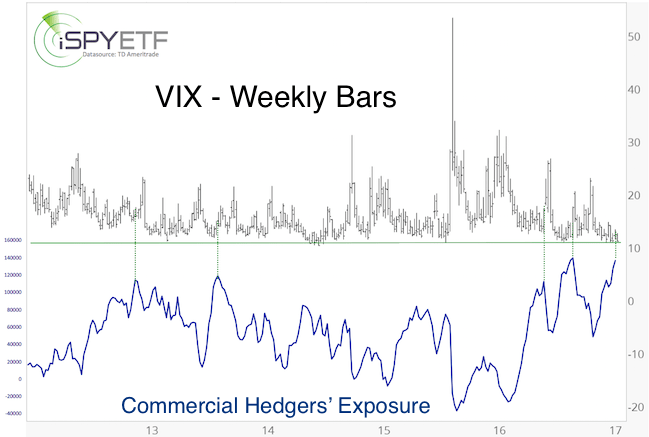 Earlier this year, in mid-January, we saw a number of VIX extremes, such as highly elevated SKEW readings (SKEW measures ‘black swan’ risk), near-record SKEW/VIX ratio readings and the highest ever long exposure of commercial VIX traders (smart money). The charts below, published by the Proift Radar Report in January, illustrate the extremes. Statistically, those conditions led to an average VIX spike of 22% over the next month every time (even a week later the VIX was higher 85% of the time). The biggest problem (which we were well aware of) was the lack of a suitable trading vehicle for long VIX exposure. Yes, there is VXX, but it suffers from contango (we have often successfully shorted the VIX via XIV, which puts contango in our favor, more about XIV below). The VIX quoted in-day-to-day life is the CBOE Volatility Index (VIX) spot price (today’s VIX price). However, the futures used to create ETPs like the iPath S&P 500 Short-Term VIX Futures ETN (VXX) are based on the future VIX price, which is almost always more expensive than the spot price. Over time the more expensive VIX futures decline in value, eventually converging with the spot price at expiration. The chart below compares the current spot price with various futures prices. The difference between the spot price (12.20) and the September futures (13.45) is 9.84%. In other words, it will take a 9.84% move in the VIX to neutralize the time decay between the spot and September futures price. As time goes by, ETF providers are forced to continuously replace expiring futures with new (more expensive) futures (this process is called ‘rolling over’). The further away the futures expiration date, the bigger the time premium. This time premium and resulting value decay is called contango. Despite contango, the VIX buy signal seemed strong enough to deliver a net gain (a 20% short-term VIX spike tends to translate into a 5-7% VXX gain). 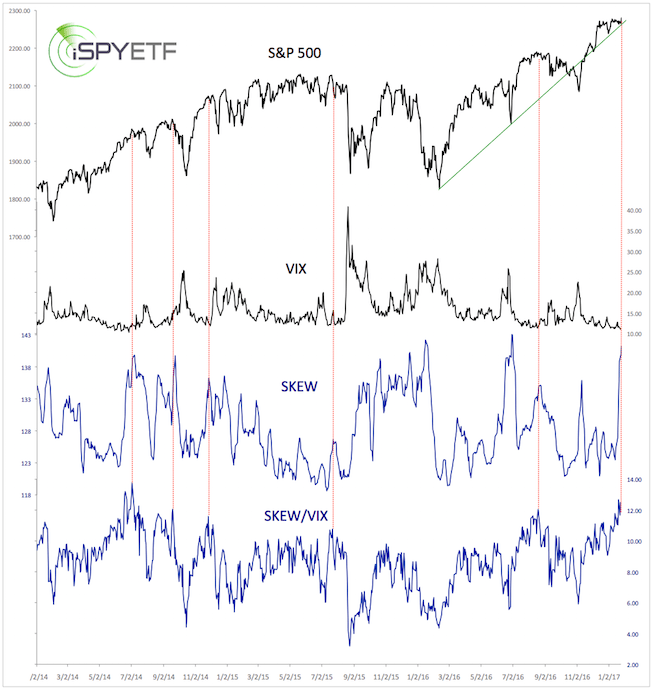 We were looking for a short-term VIX spike, before a multi-week S&P 500 rally. On January 23, we pulled the trigger and bought a very small amount of VXX at 20.60. A week later, the VIX traded higher, and a month later, the VIX traded higher. The VIX even spiked 22% (as expected) a number of times, but VXX contango persistently eroded VXX. VXX by-passed the short-term VIX spike, and then, as anticipated, the stock market continued higher (which kept the VIX depressed). Nevertheless, we expected a period of choppy trading (volatility) to start in February/March. On March 1, the S&P 500 topped, and has basically been range bound since. On March 23, it was obvious that the VIX would fall again before the next window for a S&P 500 correction arrived. We bought XIV to hedge VXX, which turned out to be a great move. Unfortunately there was another blow. The S&P 500 missed our trigger level for XIV and VXX (2,407) by one point (on Tuesday, March 16). The S&P gapped lower the next morning (by 17 points), robbing us of the best opportunity to unwind this trade. We took the second-best opportunity. The March 17 intraday Profit Radar Report recommended to sell XIV at 77.40, and double up on VXX at 14.45. We closed XIV for a profit of 12.17% and bought VXX at 14.45. The next morning (Thursday, March 18) we closed our entire VXX trade at 15.97. The VXX portion bought on January 23 accrued a 22.47% loss, the VXX portion bought on May 17 ended with a 10.51% gain. The 11.96% loss was offset by the 12.17% XIV gain. At the end, we closed this unfortunate trade combo with a tiny 0.21% gain. Patience and impeccable timing (at the end) rescued this trade, but in hindsight, the best worst trade is one not taken. Contango needs to be respected. In the past, we traded XIV six times (XIV benefits from contango). All six XIV trades were profitable (12.17%, 14.46%, 13.33%, 7.57%, 15.70%, 4.49%). It’s better to focus on XIV (falling VIX) than VXX (rising VIX), especially in a bull market. Although we knew that the VIX would fall mid-term, we bet on a short-term rise. It’s not smart to bet against the larger trend. With the VXX trade closed at a miniscule profit, we keep our streak of no losing trade (since June 2015) alive. 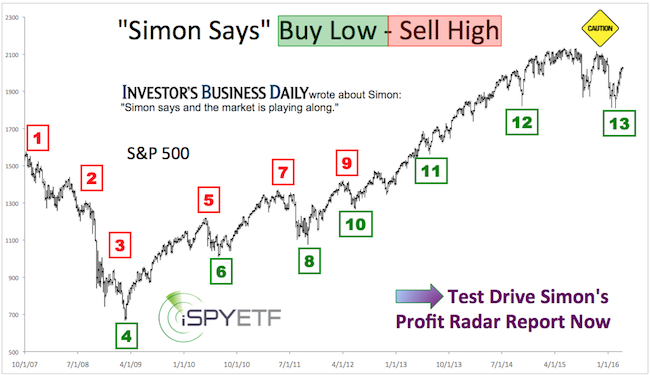 The Profit Radar Report provides about 20 specific trade setups per year. According to Barron’s, the VIX is flashing a stock market warning. Barron’s is not alone. If you threw a water balloon in a room filled with analysts, odds are you’ll hit someone who’s bearish stocks because of the VIX. VIX readings below 10 are rare. There’ve only been 9 other ones since the VIX’s inception in 1993. None of them led to stock market crashes (click here for detailed analysis). Some claim that the 2000 and 2007 market tops were preceded by a low VIX, but that’s one of the biggest misconceptions on Wall Street. 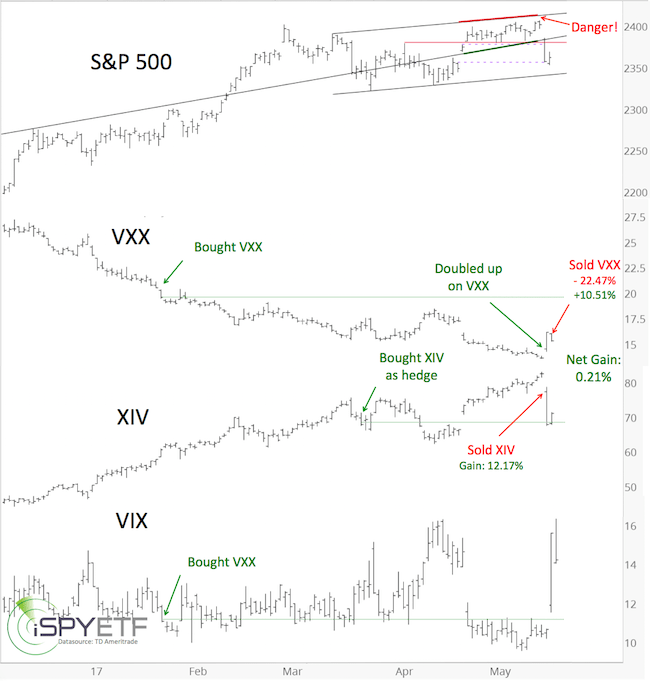 This special report, published by the Profit Radar Report on June 16, 2014, showed why the VIX was TOO LOW for a major market top back then (and still is today). 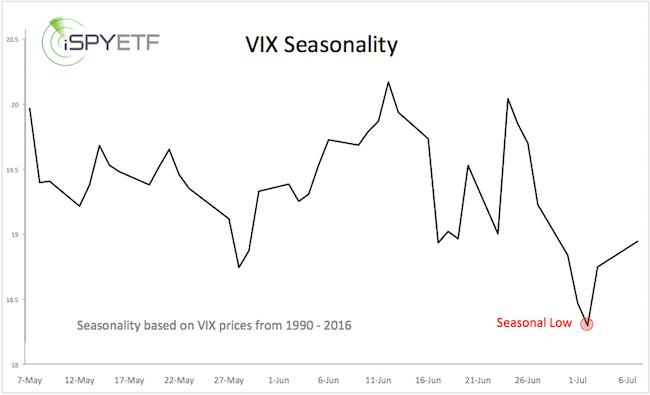 VIX seasonality supports overall lower readings until the major seasonal low in early July. The chart below plots the S&P 500 against the VIX, VIX/VXV ratio, CBOE equity put/call ratio, and contango. The VIX/VXV ratio gauges fear of short-term volatility (30-day, VIX) compared to longer-term volatility (90-days, VXV). Readings above 1 happen when investors are more concerned about the short-term than longer-term. This occurs near stock market lows and has been a very reliable buy signal. 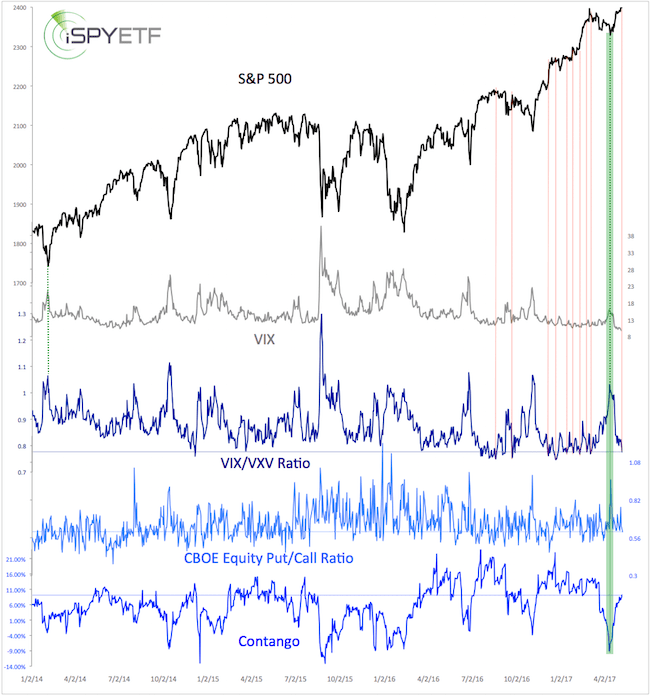 The April 16 Profit Radar Report noted the VIX-sell signal highlighted in green (VIX is down 39% since). On Monday, the VIX/VXV ratio was 0.776. Readings below 0.76 happen when investors are more concerned about the longer-term than the short-term. Although a potential warning sign, the VIX buy signal (<0.77) has not been as accurate as the VIX sell signal (>1.0). The CBOE equity put/call ratio and contango are showing a measure of bearish (for stocks) potential, but have plenty room to become more extreme. The April 11 Profit Radar Report published the chart below along with the following forecast: “As long as trade remains above 2,330, we are still looking for higher prices. 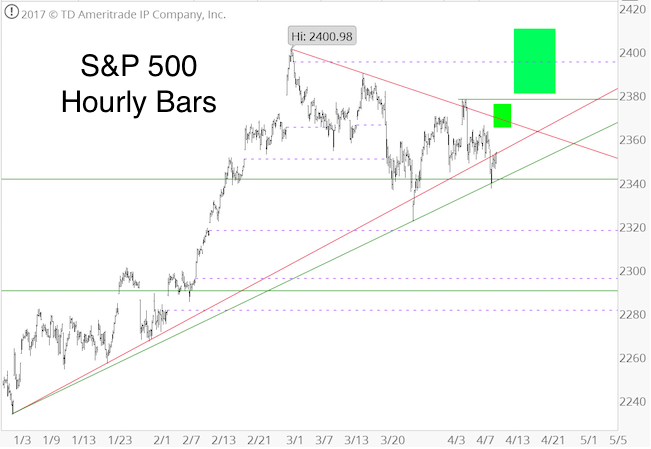 The chart below outlines two potential up side targets (2,365 – 2,375 and 2,380 – 2,410).” The upside target was revised to 2,405 – 2,410 on April 26 (more detailed outlook available here). The S&P is now just below 2,410. It remains to be seen whether bears will take a stand, but if they do, it should be around 2,410 (which would result in a VIX spike). Continued analysis for the S&P 500, VIX and other asset classes is available via the Profit Radar Report.